I’m all a-jitter today because the last 6 weeks of creativity, stress, and nerves have finally come to fruition! I’m so excited to share my Spring 2018 One Room Challenge with you — Home Glow Design’s Ultimate She-Shed! I’m a New Hampshire designer & writer. I started my business in late 2016 because I knew what I saw in the design magazines didn’t come from a big box store catalog … and I wanted to let homeowners know that the totally unique and character-filled interiors they wanted weren’t stylistically out of their reach, either! I love gorgeous colors and patterns, and I’m a sucker for architecturally/historically-inspired fresh classic design. 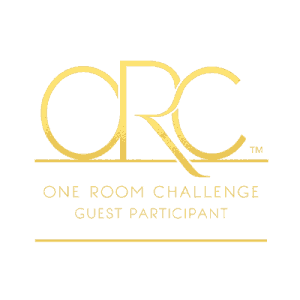 The ORC is a twice-a-year event where 20 invited designer/bloggers and a host of guest participants complete a room in 6 weeks, with a weekly blog post to update on progress. This is my second time as a guest blogger. The She-Shed was plagued by a number of out-of-stock, damaged deliveries, and tight, tight, timelines, in the first few weeks. However, amazingly, everything came through (or we found alternatives!). But it wouldn’t be the ORC without a lot of stress! You can check out previous weeks below. Some golden nuggets of info are included in previous posts. WEEK 2 — THE PLAN AND THE PROBLEMS!!! My She-Shed began its life as a 19th century blacksmith shop attached to our 1790 New Hampshire farmhouse and has had many renditions and purposes since. Most recently, it spent 20+ years as a storage area. 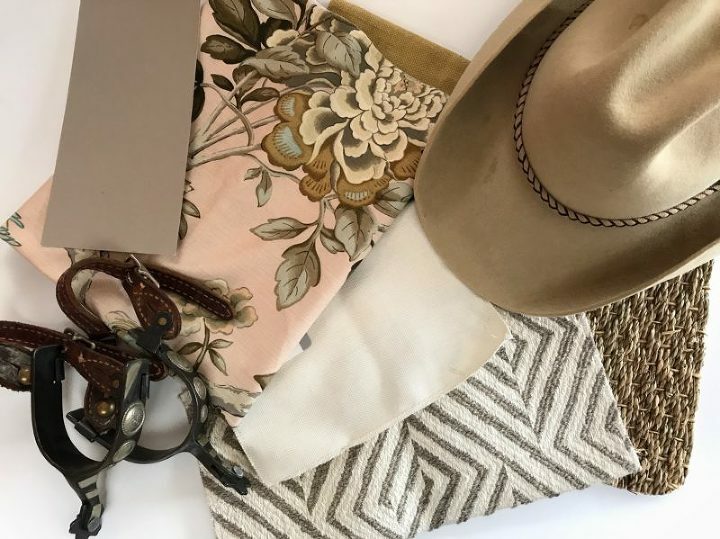 That lovely blush colored fabric with grays, camels, and bronzes together with the below amazing chandelier formed my design launchpad. A few “before” pics, to remind you of the space. Yep, we still had a fair amount of snow when the ORC began in April. Are you ready for LOTS of pics? All “after” photos by Sabrina Cole Quinn Photography, unless otherwise noted. We took off the nasty broken screen and gave the door a fresh coat of Dunn-Edwards Iron Creek. As for the rest of the exterior paint job … well, we left it rustic. It was not in the budget, and heck, I live in a small village in New Hampshire, not in Greenwich, CT. It will get a new coat of paint when the rest of the house paint pops in a year or two. The darkened brass light fixture is by Northeast Lantern, a New Hampshire company that makes solid brass lighting with a lifetime guarantee. I also featured them in this post about 7 Lessons Learned in Outdoor Lighting. Their stuff is worth every penny. Come on in! Photo by the Handsome Husband. In addition to the Fenwater chandelier, supporting-role lighting played a huge part in the overall harmony of the room. I chose Hudson Valley’s Woodstock Flush Mount in polished nickel (the holophane glass is perfect for this slightly industrial/masculine space), and 2 large Garden City Sconces. Two Kallax shelf units laid horizontally hold my fabric books and product catalogs. Tjena magazine files hold wallpaper samples. Both from IKEA. I combined a custom desk chair with my cherished vintage Stickley quarter-sawn oak, craftsman-style desk for a masculine/feminine dichotomy. I used a Pindler outdoor fabric, Bayside in Eggshell, for the inside seat, back, and arms, and a textural Highland Court asymmetric woven, Colea in Latte, for the outside back and arms. The fabulous cowhide rug is from one of my trade wholesale sources. For my cork wall (how-to detailed in Week 3), I used this CORK ROLL FROM AMAZON and THIS ADHESIVE. It is awesome for pinning up all my inspiration and almost completely disappears because we coated it in 3 coats of White Dove OC-17 by Benjamin Moore. Speaking of paint, we used White Dove for all the walls and trim, the latter painted in the ADVANCE formulation. It’s the closest thing to an oil finish on the market! (For more details on the best way to cover up knotty pine, see week 2.) The ceiling is painted Quicksand CSP-200, one of Benjamin Moore’s Color Stories full-spectrum paints. In the above pic, you get a a glimpse of the chandelier, which was actually rather difficult to photograph, because we couldn’t pull back far enough for a full shot without aiming up. The “tiny house” nature of the space does come with some inconveniences! A better shot of that “chandy” coming up. A detail shot of the feminine Roman shades we did. I ADORE the blush with the camel color combination — keeps the fabric from becoming too saccharine or millennial, IMO. (I am Gen X and proud of it!) The fabric is Pindler’s Treeblossom in Blush trimmed with Romo’s Linara in Safari. You can read more about my obsession with this style of window treatment here. Most projects in these post-Great-Recession days have some element of high/low to them — spend more here, spend less there — etc. While I don’t normally specify IKEA furniture for clients because I tend to decorate looking toward the long haul, in this office space they were just the ticket! I chose my Skarsta Sit/Stand Desk for working with plans and samples, as well as having one-on-one client meetings, and my Alex unit on casters for storing all my tile samples. I have 2 Hemnes bookcases flanking the front door, with small water hyacinth baskets from The Container Store for organizing all my loose fabric samples. As you can see, I moved the ladder to the other side of the room from where it was originally. I wanted the space to feel more open as you came in the door, looking to the work table with sconces and inspiration board. Moving the ladder also enabled me to create a cozy little area for my Stickley desk. It fits perfectly here — both in terms of size and style. The vintage-industrial style Luton Stools are from Dovetail. 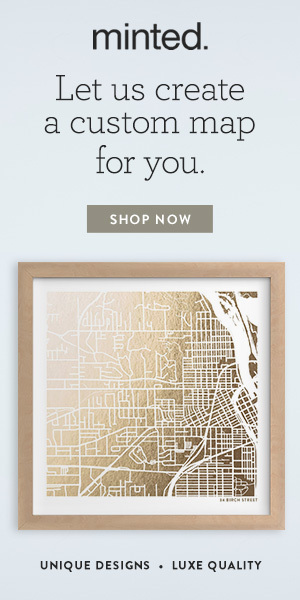 I can buy direct, but you can also find them here. They are super heavy. The knit basket was a Home Goods find. I forgot to have Sabrina shoot this angle, but I really wanted to show off the steel railing that local craftsman Chris Martin of Absolute Welding & Fabrication made to replace that nasty one in the old space (read about it in week 5). It came out just the way I envisioned it and at less than 1/10th the cost of having something custom made in actual bronze. And, of course, there’s my fabulous chandelier again!!!! I debated for quite some time as to the flooring in this space. Originally, the building would have had a dirt floor. Fifty+ years ago, it was put on a concrete slab and first linoleum and then basement-type carpet had been installed. I couldn’t be restorationist in my vision (Dirt? No, thank you. ), but I wanted something classic and historically-inspired, if not accurate. Wall-to-wall seagrass carpet (see week 4 if you have any Qs as to pros and cons) seemed the perfect fit — a time-tested classic, ultra-durable, natural, economical, and perfect for layering with accents rugs. I chose this pattern from Fibreworks, one of my vendors for carpeting. Kuggi stackable bins from IKEA combined with Reusable Dry-Erase Labels from the Container Store keep my client projects and samples organized. Wall hook in soft iron from Target. There you have it — Home Glow Design’s new office space, the Ultimate She-Shed! Taking a break before getting back down to work. Lord, I miss my cowgirl hat! Thank you, Linda, for creating the ORC so that we all can get our homes decorated before we die! And kudos to House Beautiful, Media Sponsor of ORC! And thank you — all of you! — for joining along in this journey! I hope you will check out all the other bloggers and their transformations, as well. Lastly, if you like what you have seen/read, please come back on Saturday for Home Glow’s regular “Saturday Blog” post.